Self Standing Colorado Big Horn Sheep. It is painted on a flat board as though you were looking at it from across the mountain. 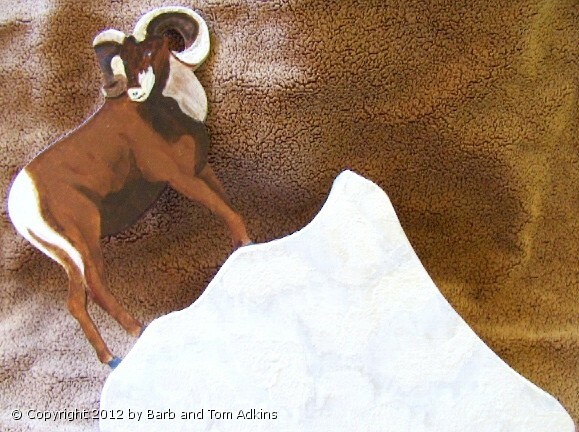 While the Big Horn is flat, we mounted him on Snowy Rocks to look like he is climbing the Mountainside. The base of snow is about 1/2 " thick. The Big Horn is 1/4" thick. The horns grow on the males and curl around as the animals grow older. The color of the fur changes from gray to cinnimon brown in different lighting and the time of the day. Colorado has it's own heard of Big Horns living in the mountains about an hour west of Denver. There is also a heard in Rocky Mountain National Park. These Big Horns would look Wonderful on the Dinner Table at each Place Setting. Mix them up with other animals such as my Mini Mt Goats. These are great at the base of candles on a shelf or table or gazing at your from a near by shelf or table. A nice reminder of your visit to Colorado. 1 for $25.00, 4 for $80.00 Consider Mixing & matching all 3 pieces or ordering a Bear or other mountain animal. Shipping & Handling not included.